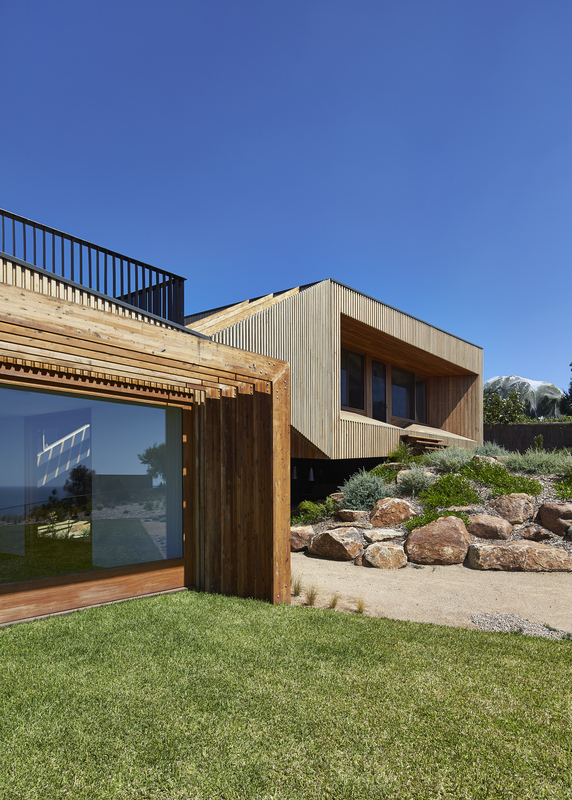 A contextual design response to an aggressive coastal site, Split House embraces less formal modes of living and the warm, tactile quality of timber. Set within a relatively recent subdivision upon the side of Mt. Martha, the Split House negotiates a complex range of conditions typical of emerging coastal developments. 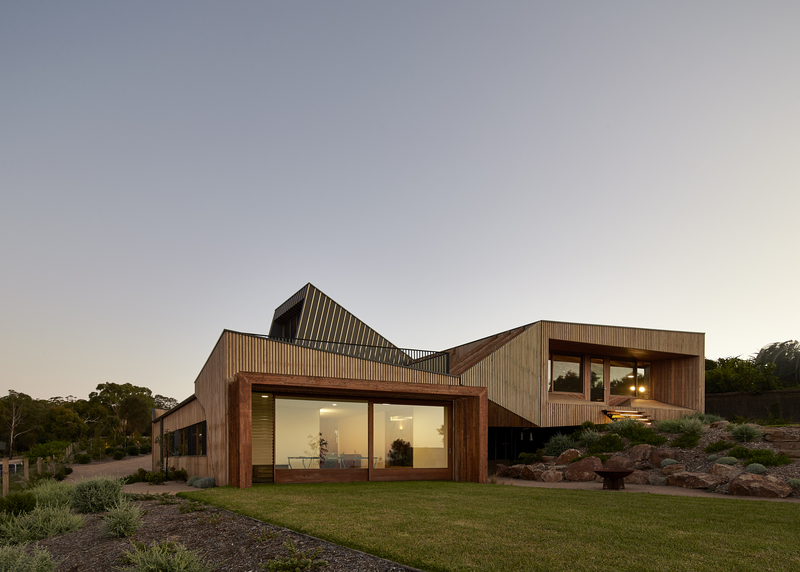 New houses in a suburban mode, paved driveways and letterboxes prevail, vying for the expansive views to Port Phillip Bay, and backed by the coastal woodland of Mt. Martha Public Park. 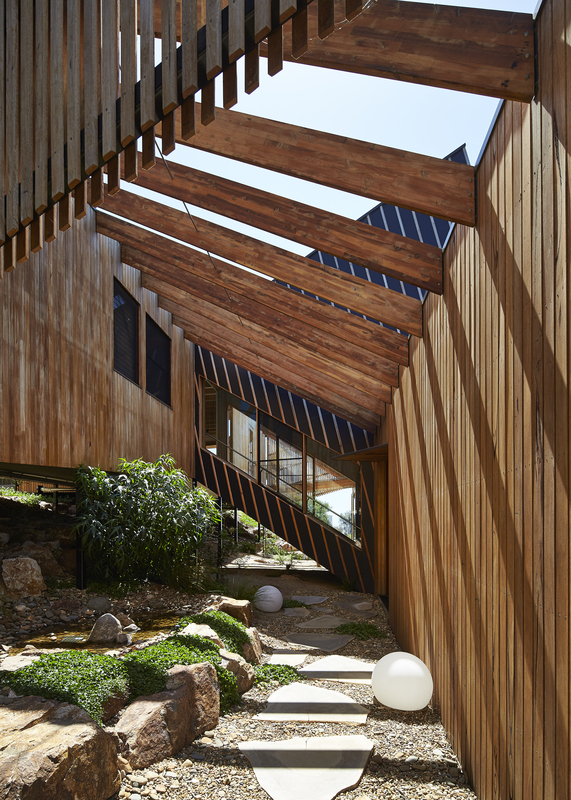 At the outset, the intent for the Split house was to embrace less formal modes of living and occupation, more akin to the beach house than McMansion by the sea. Extensive use of timbers internally and externally was employed to imbue spaces with a warm, tactile quality. 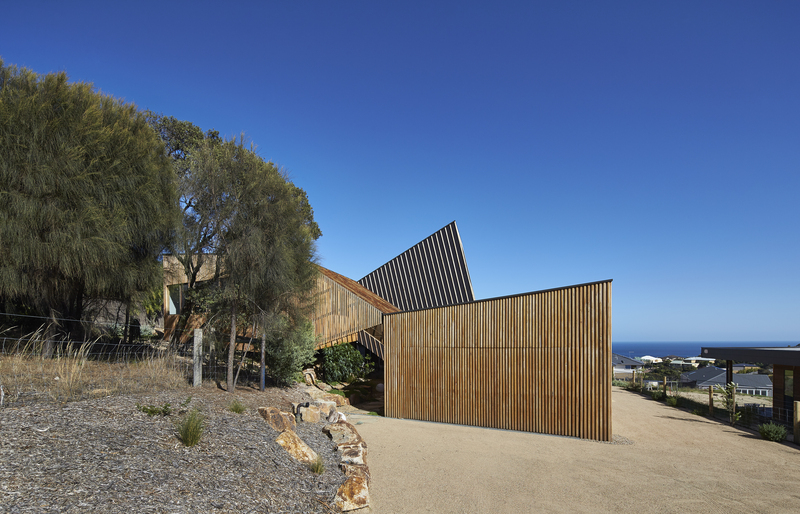 Within this exposed and relatively aggressive coastal environment, timber was considered an appropriate material for longevity and to provide a contextual design response to the site. External timbers will age naturally, greying off over time to further embed the house within its surrounds. Structural timbers were celebrated as part of the architectural design. LVL was used throughout for hidden roof structure, with exposed Unilam Glulam members used within living areas in the upper pavilion. Externally, Durabeam Laminated Cypress beam and posts were employed for structural elements that act as screening pergolas and raking beams that complement the building design and provide definition to outdoor spaces. 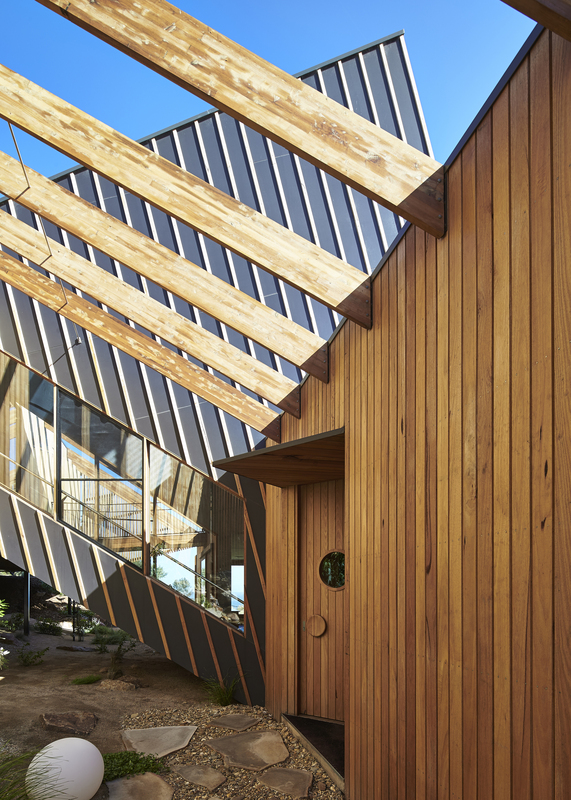 Structural timbers were considered as intrinsic to the architectural design to augment the extensive use of other finely detailed timber cladding, screens and joinery elements. Internally, exposed glulam beams are used to provide definition and a sense of warmth to interior living areas. Engineered timber was specified in consultation with the project engineers in order to limit the use of structural steelwork throughout the project; this was done in order to minimise the environmental footprint of the building through reduced embodied energy. Timber was preferred for its ease of handling on site and its durability within a coastal environment. Silvertop Ash Radial Sawn timber in Shiplap profile was used to clad the majority of the house, with specific areas overclad with Silvertop Ash Radial Sawn Battens. 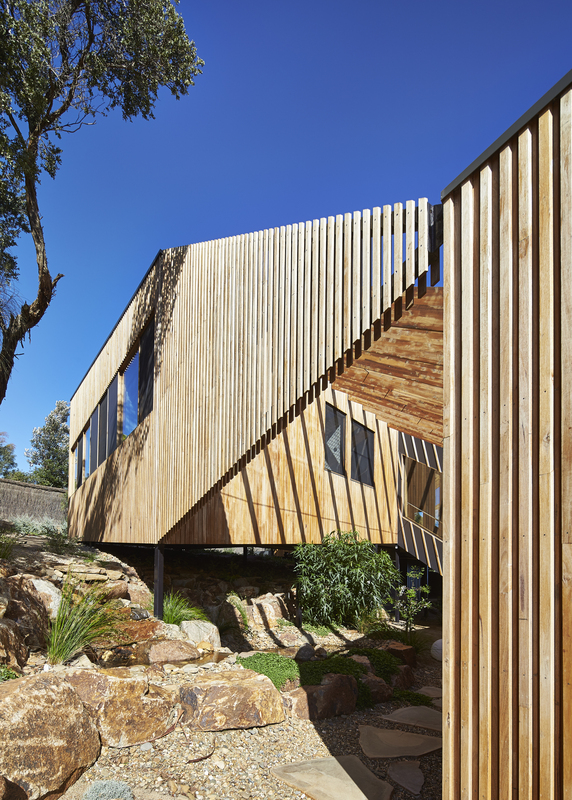 The timber battens were also expressed in the cladding to the central stair atrium element over fiber cement sheeting as well as transparent screening elements that partially enclose the external courtyard area between the house’s two primary volumes. Externally engineered timbers were finished with a penetrative oil coating (Cutek) that would allow the timber to grey off over time as the surrounding landscaping settles and evolves. An engineered timber grid shell is the centre of an arc of teaching, sports and performance accommodation.